During our last meeting in June 2018, the group met in conjunction with the National Assembly’s Annual Convening. Jen McGuire and Darrel Weatherford from AdvantageTrust spoke about the program, gave updates on vendors and contracts, and talked through some ways to better utilize the program. Members also heard presentations from several vendors detailing the products or services offered through the program, before having a group discussion relating to questions, challenges, and helpful suggestions about using the program. Last year, our partners at Raffa presented on technology solutions and trends for nonprofits, especially when working with a limited budget. Particular focus was given to finance and accounting systems as well as managed versus outsourced IT considerations. John Cassell and Aadil Ikram from Spring Consulting presented the idea of a combined health insurance captive for the National Assembly & PurchasingPoint group to save money on health insurance costs. 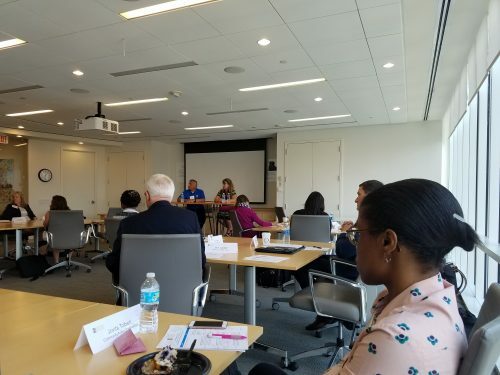 Lastly, Jen McGuire from AdvantageTrust and Val Castaneda from YMCA of the USA lead a panel discussion on managing vendor and supplier relations. The day ended with members having the opportunity to meet and discuss opportunities to save money with many PurchasingPoint vendors. The current Council Chair is Sonya Llewellyn, Associate Director, HR Services at 501(c) Agencies Trust. Want to learn more or join? Contact the PurchasingPoint Team for information.